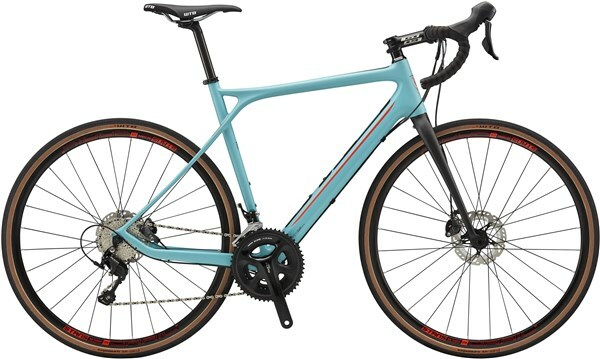 Whether you choose to travel by road, dirt, or gravel, the GT Grade Carbon Expert road bike will take them all on head first, and take you on an adventure you’ll never want to end. A bike which knows no bounds. The GT Grade is a high-tech bike designed for low-tech roads, so it’s perfectly at home riding over the Great British potholes. The endurance/sportive road geometry put riders in a comfortable upright position for long distance journeys, and helps you stay in better control of the bike over difficult road surfaces. The GT Grade Carbon blends GT’s legendary Triple Triangle design with a customised carbon fibre layup, building a bike with incredibly fine-tuned handling characteristics. This combination allows GT’s designers to make it both stronger and laterally stiffer than traditional frame shapes. What’s more, the GT Grade Carbon incorporates GT’s Dual Fibre Dynamics technology, whereby the seat stays have a solid glass-fibre core and a vibration-damping carbon outer layer. The result – more control, less fatigue, and longer adventures! Fitted with a full carbon fibre fork, the GT Grade Alloy Expert takes weight reduction seriously. It also features a race-ready Shimano 105 2x11 speed drivetrain, with an FSA Vero Compact chainset that gives you all the tools you need for long & slow gravel-track climbs, through to high speed & thrilling asphalt chutes. Fully hydraulic from the shifter to the calliper, the Shimano disc brakes give an incredibly confidence-inspiring feel beneath the lever. You’ll be braking later and harder into turns than you could have imagined, and they’re unfazed by the weather. Combined with the 30mm Schwalbe Spicer K-guard tyres, the GT Grade Carbon Expert has traction and grip in abundance. Seek out new horizons, with the GT Grade Carbon Expert road bike.